Occasionally when I’m doing an assessment at a computer workstation, I’m asked if forearm rests would be a good idea. 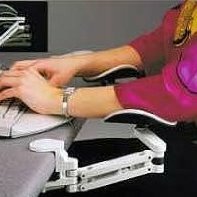 Forearm rests attach to the desk and provide a support surface for your forearms. Instead, I recommend that people place their keyboard tray so their elbows are at right angles – 90 degrees of flexion. Then I recommend pulling their keyboard tray so that their elbows rest comfortably alongside their torso on each side of their body. In this posture, there is no strain being placed on any muscles because everything is in neutral posture – the upper arms hangs loosely from the shoulder joints and the forearms are in-between flexing and extending which is considered neutral posture. Neutral posture is the goal of all postures in ergonomics because it provides the least amount of muscular strain to the body.